I began writing this post several months ago when the NICU director from Cook Children’s Hospital asked George and I to speak at an upcoming event about infant mortality. I abandoned it for fear of seeming lackluster or coming off as conceited. However, I’ve recently come into contact with several expectant mothers of multiples and think this post is worth finishing. Apparently Dallas and Tarrant counties boast the worst infant mortality rates in Texas and some of the worst in the United States. I stumbled across articles from The Star Telegram and Washington Post that mention some startling statistics. According to current research, it appears that prenatal care is one of the most critical factors. The NICU director felt that George and I made sound decisions early on to help me carry the babies as far as possible for the betterment of everyone’s health. Reflecting back on the dog days of my pregnancy, here are some of the things I feel were beneficial. When family building did not come as easily as anticipated, George and I decided to change our lifestyle to one of health and wellness. We figured if we were dealing with infertility we knew we were in for a journey and better prepare. I mean, you wouldn’t attempt to run a marathon without getting into shape first. Just like a marathon, pregnancy is difficult on the body. After scheduling routine physicals and catching up on vaccines, we developed an exercise regime. Together, we took kickboxing classes twice weekly and I practiced yoga three days a week. Additionally, we made an effort to eat well. We cooked fresh foods at home most of the time and rarely ate out. I can honestly say I was in the best shape of my life just before becoming pregnant with the quads, even better than I was at 18. The day of our initial sonogram with the quads, we knew we needed the best doctor for the job. My RE referred us to a perinatologist who had experience with high order multiples, including several sets of quadruplets. All of my prenatal visits were exclusively with my perinatologist. 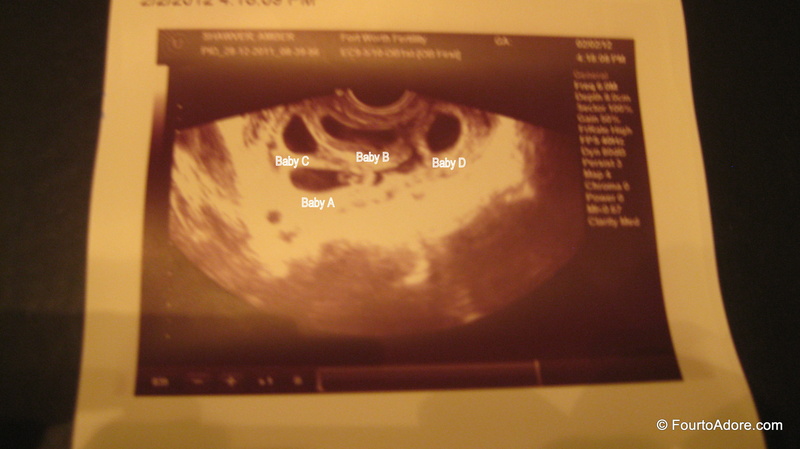 This was our first ultrasound and the only time all four babies were captured in one image. Together, we made an effort to educate ourselves about pregnancy, especially regarding multiple gestation. This included close communication with my perinatologist. I read several books, including The Mayo Clinic Guide to a Healthy Pregnancy, which was my favorite one. I read a few books about twins, but chucked them when they only mentioned terrifying things about high order multiples. Fear was not helpful to me. 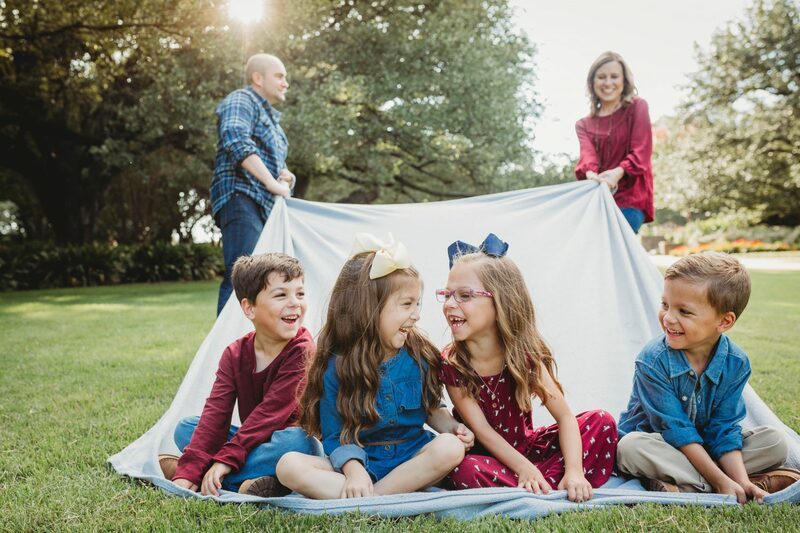 The single best advice I received from Dr. Tabor was to look up Steece’s Pieces, a blog maintained by a former patient who also had quadruplets. I read the archives of her blog many times over to help cope with bed rest and the future with four babies. I kept contact with other mothers of quadruplets, both expectant and mothers of older children. They served as a resource for “Is this normal with quads?” and served as a sounding board. 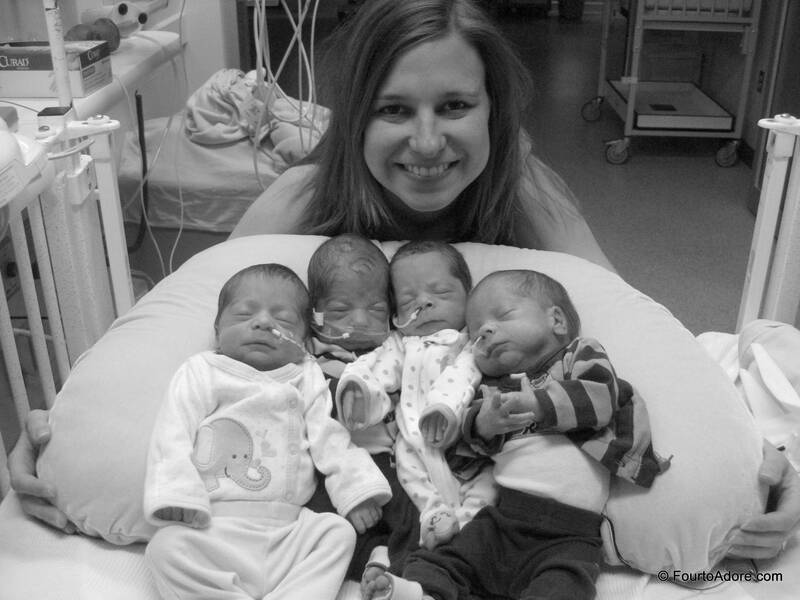 In fact, this wonderful group continues to serve as a resource for raising quadruplets. During my pregnancy, my doctor advised a diet of approximately 3,000 calories. This included the usual 1,800 calories for me and an additional 300 calories per baby. I could have easily met the 3,000 mark with a few Whoppers and Blizzards, but I knew that what I ate was for the babies. I wanted those calories to count. I kept a variety of healthy snacks in my office (when I was working) and at home. I noshed on things such as Greek yogurt (high in protein and calcium), nuts, fresh fruits and veggies, popcorn (high in fiber), cheese sticks, and protein shakes. I also drank water by the gallon. If a visitor ever asked what she could do for me, I would ask for a refill on both of my large Tervis Tumblers. Staying hydrated was critical to keep contractions at bay and to help keep amniotic fluid levels stable (Sydney’s fluids were low at several appointments). I veered away from most other beverages, particularly caffeinated drinks. Popsicles, however were a fun source of fluids especially in the Texas heat. Can you spot the two Tervis Tumblers on my nightstand? 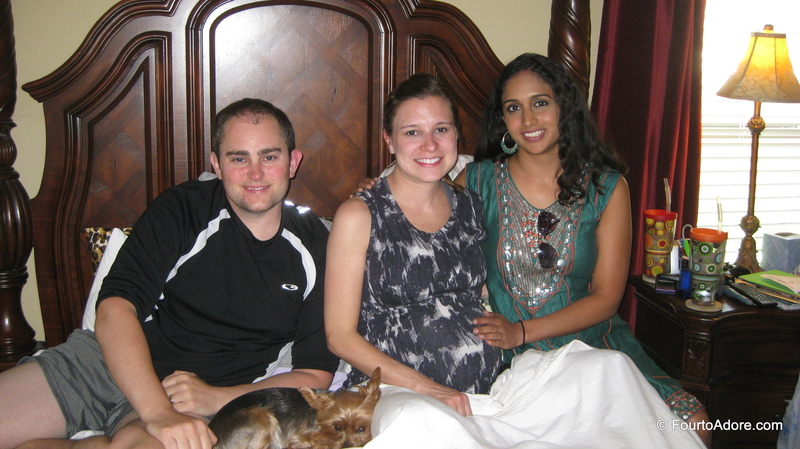 They remained at my side the duration of my pregnancy. Prior to taking any medication or supplements, I consulted with my perinatologist. I have a blood clotting disorder called MTHFR and was prescribed a mega dose of folic acid and low dose aspirin to manage it. In addition to those, I also took gummy prenatal vitamins (I could not keep the regular ones down so I opted for gummies) plus calcium and iron. Just prior to being put on bed rest, I could feel my body become increasingly taxed. After years of practicing yoga, I knew it was critical to listen to my body. If I felt dizzy or fatigued, I simply rested. It did not matter if I was at work walking to a classroom or at Walmart. I literally found a suitable place to sit and I took deep cleansing breaths as I rested. When I felt normal again, I took care to rise slowly and carry on. When I felt thirsty or hungry, I took care of those needs. I never pushed myself beyond what I felt my body could manage even though that is something I tend to do. I knew that pregnancy was not the time to test my limits or try a bit harder. I am a highly independent person and I struggle to accept help. However, with a high risk pregnancy, I knew it was necessary to swallow my pride. When I was working full time, I was not ashamed to prop my feet on a box at my desk, to sip water during meetings, or to roll my ergonomic chair to conference tables. The weeks just before bed rest, I wanted to do a lot of “nesting” but knew I needed to be wary of overdoing it. When I went shopping, I did the unthinkable and used the store’s power chairs. It was totally embarrassing zipping around in those, but it was good practice being noticed in public. Looking back, it was probably more discreet for a pregnant girl to ride in a power chair than for me to push a stroller limo loaded with four babies now! For the first time in my life I also let the bag boy at the grocery store load my car and I let people do things for me at home. When I was bed ridden it pained me to sit idle while other people cooked and cleaned, but I knew that was for the best. 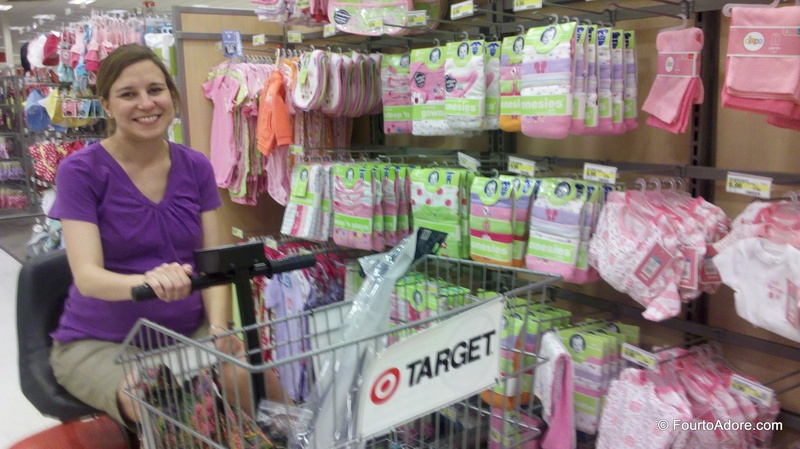 Oh yeah, here I am rocking the Target power chair! 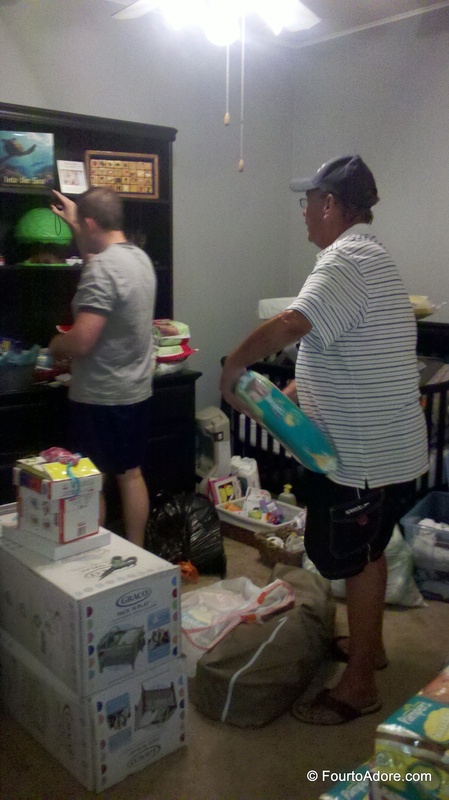 Here is an instance where I had to let George and my father in law handle something I wanted to do: organize the nursery closets. I am a rule follower in pretty much every aspect of my life, from turning library books in on time to coming to a complete stop at stop signs. Pregnancy was no different. I did EXACTLY as directed. When put on strict bed rest, I took it seriously. I literally stayed in my bed except to go to the bathroom and shower. After the first few weeks of strict bed rest, George impassingly mentioned to Dr. Tabor that I had not been in the kitchen. Dr. Tabor was literally stunned that I followed his orders exactly. I suspect this is one of the reasons I was not admitted to the hospital (rumor has it that Dr. Tabor prefers to admit mothers of high order multiples early so he can keep an eye on them). 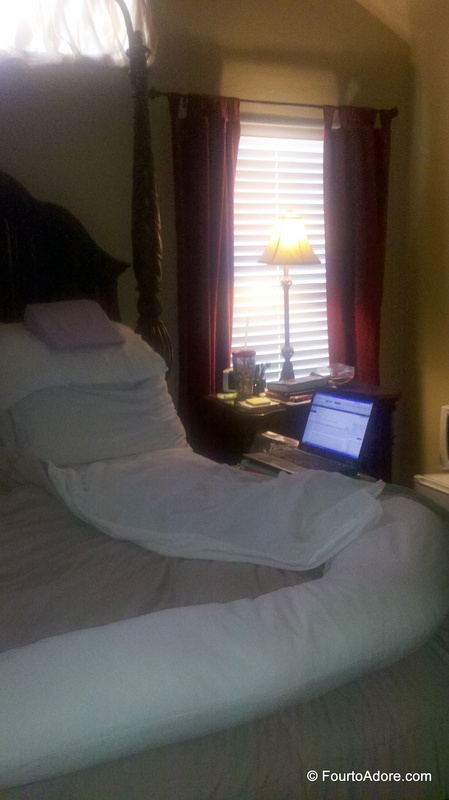 This was my bed rest set up complete with Snoogle pillow, wedge pillow, and laptop. I later swapped the laptop for a secondhand ipad, which was much lighter and easier to manage. 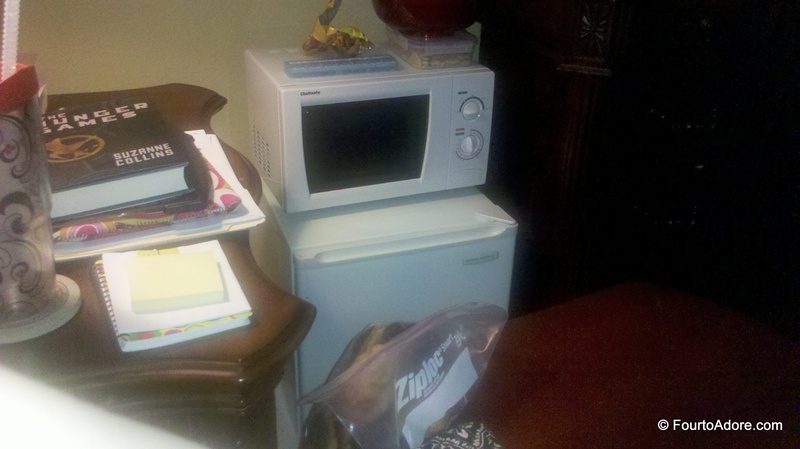 We kept the mini fridge and microwave from my office at my bed side. George stocked it nightly so I could easily access snacks in the day. You’ll notice a notepad, Ziploc of snacks, wallet, and book on my nightstand as well. I kept a running list of things I wanted to accomplish each day so that I did not feel like a sloth. I read to keep my mind busy and nested by shopping online for the babies (hence the wallet next to the Ziploc). Because quads are always delivered prematurely (34 weeks is usually the furthest they can be carried), we knew there would be a NICU stay. Early on in the pregnancy, George and I compared the NICU facilities in our area and took tours. We made the decision to have the babies transferred to the nearest children’s hospital (Cook Children’s). While we knew our delivery hospital could provide outstanding medical care, we felt that the children’s hospital would better meet the needs of our family and provided a family centered approach. I encourage all expectant parents, especially those in high risk situations, to be aware of the NICU facilities available to them. Even parents with one baby and no known risks can have surprise NICU stay. Being aware of options ahead of time can serve you well in the future. Knowing the risks involved carrying four babies, George and I do not take our babies’ health for granted. We count our blessings every day. This was a special moment when all babies were reunited for the first time since delivery. They were four weeks old. Ultimately I did everything in my power to sustain my pregnancy as long as possible and to give the babies the best chances I could. I never wanted to look back and wonder “what if”. However, every mother and baby is unique. Some mothers do everything perfectly and outcomes are not as good as ours. Other mothers seem to make all the wrong choices and yet everything is problem free. The best advice I can offer if you are expecting one baby or seven babies is to do your best to make sound decisions for yourself and your babies. I think we went to the same “quad guy” or for me “triplet guy”, lol. Ohhhh the power chair!! I was mortified every time I had to use it. LOL, he IS the “triplet guy” too. I was mortified by the power chair, but seriously I get WAY more stares now with the babies in two. Oh, how far we’ve come!! You did, and continue to do, an amazing job caring for your sweet fab four. Reading this reminded me of how much we endured during our quad pregnancies and how relieved I am to have that all behind me. Though I would have Hung upside down if it meant prolonging their delivery!!! So glad to have a friend in you, Amber, and I look forward to our kids growing up together!! It is crazy the difference between last year and this year for both of us! I would have hung upside down too if they said it would help me carry them longer. I could not agree more, I cherish our friendship and I look forward to making years of memories as quad families! Great post, Amber! You summed it up well, and I hope other hopeful and expectant moms are encouraged. Thank you! I hope it is encouraging to them too. Looking back, I remember how much guidance I wanted from moms who had been there. Great info and just so much encouragement! Thanks for this post!! Just wanted to say that I love your positive thinking! I turn to your blog often as I sit on week 7 of bed rest and knowing the high likelihood of my twins facing NiCU time. You have handled it all so well and have beautiful babies to show for it! Thank you for your calm demeanor!! Oh girl, you are in the thick of it with bed rest! In the moment it seems like FOREVER, but I promise it will soon be a distant memory. Writing this post was a reminder of the journey and difficult moments. Do your best to keep them cooking, but do not guilt yourself either. Haha, I’m sure most pregnant ladies want to be asked if they are carrying multiples too. A great start to your book. Gosh I need to get going on that. What a wonderful story. My husband and 7 weeks, 4 days pregnant and me and my sister in law heard the heartbeats at 6 week 5 days and they have named them baby a, baby b, baby c and baby d. I have a similar first ultrasound photo. That day, My sister in law cried and I am overwhelmingly happy too. I just haven’t been able to show it yet as I am too busy researching what is the art of making sure this will have the best possible outcome. The day of the ultrasound I was just thinking how quiet my body is. No signs but lots of bathroom breaks. I had no idea there would be 4 in there. I wanted to move the monitor and see was there another girl behind there or what. Now that this is happening, i am grateful but I have this feeling like i have so many questions but I do not know what to ask. All they told me so far is that I must go back every week and I need a high rise OBGYN that can help with multiples. Thank you for sharing. I learned a lot from the above and the babies are such an inspiration. I will follow instructions very carefully to ensure all will go well. I will put it in Gods hands as you did. I have done 1) Got in Shape Before hand. 2) I Found the Quad Guy here in AZ, Dr John Elliot, i see him on the 13th. I think he is baby whisperer or something he can take 10 babies to 34 weeks though I am just having Quads. (smile) I have so many questions about how this work. 3) Keep Hydrated. I drink 3 liters of water a day but I can increase it. I am also working on the other #3) educating myself but this is quite a task. You have named some resources that would help on this and i thank you for that. I need to work on the rest of the prep list so i can be that much further, like counting my calories and eventually getting up to 3000. I am 5″8″ and 125 pounds so I have never done that before but I called my husband to see his thoughts after reading this and he says there is an app on my I phone that we can download. I feel much better reading this it’s like somebody giving a bit of a road map. Researching NICU’s. that is brilliant. Thank you so much for the tips. Here is to planning for a successful outcome. I pray your kids are well. Congratulations! I know it is a bit overwhelming at first. One reason I keep the blog up is to help future generations since there aren’t many resources for quads. I’ve heard others say Dr. Elliot is the “Quad God” so you are going to the right place. Please let me know if you have any questions. I know I had MANY during my pregnancy and thereafter.